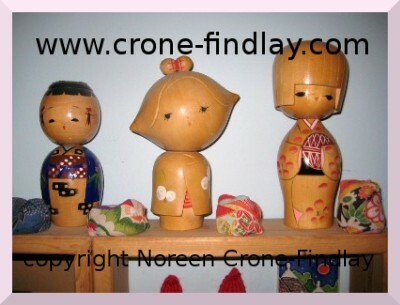 I have been in love with wooden dolls since I was a little girl. That was it… I was smitten! I was awestruck by the mastery of the wood turner who was able to create the head of the little girl in the middle on his or her lathe! 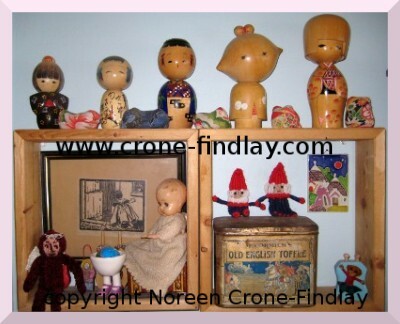 The little fellow on the right looked like he had been a lamp at one point in his life, as he had the remains of an old lamp fixture in his wee wooden noggin. and the little girl in the brown kimono was 50c on a ‘get rid of this stuff’ table in front of a thrift shop last summer. 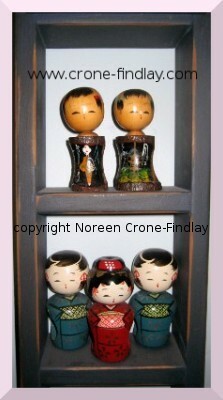 I just love the quirky pair of Kokeshi that are on the top shelf in the pic above. Someone wrote ‘1963’ in pencil on the bottom of them. There’s a lot of Japanese characters, too. I love that the wood turner who made them left part of the rough branches as part of their bodies. It’s almost like they are nature spirits. The trio below them must have been meant to be napkin holders, as they have big round holes in their little bodies. 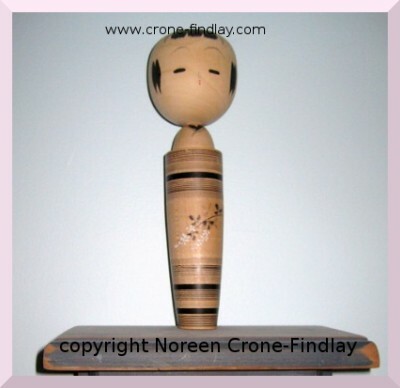 I have to admit that this beautiful Kokeshi is my most favorite. She’s so elegant and spare. Some of them are a touch heavy on the ‘cute’ end, but not this beauty. Pure and simple. 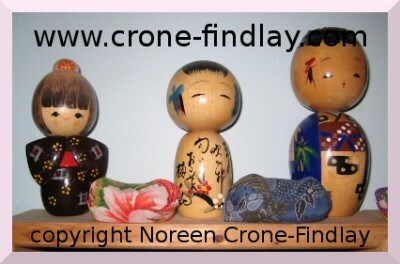 I never intended to collect them, but, one Kokeshi lead to another, and they had captured my attention. Before I knew it, I had fallen in love with them, and my ‘Kokeshi radar’ went up. I am way behind with looking at other blogs!! I only just found this post and I think you and I share the same kind of attraction. I had Matroushkas, Jumping Jacks, Kokeshi dolls, peg dolls, figural needlecase dolls etc., and all this lead to spool knitters!! LOL! !